WASHINGTON -- It's flu shot time, and health officials are bracing for a potentially miserable fall and winter. The clues: The Southern Hemisphere, especially Australia, was hit hard over the past few months with a flu strain that's notorious for causing severe illness, especially in seniors. "We don't know what's going to happen but there's a chance we could have a season similar to Australia," Dr. Daniel Jernigan, influenza chief at the U.S. Centers for Disease Control and Prevention, told The Associated Press. The worrisome news came as the government urged Americans Thursday to make sure they get a flu shot before influenza starts spreading widely. 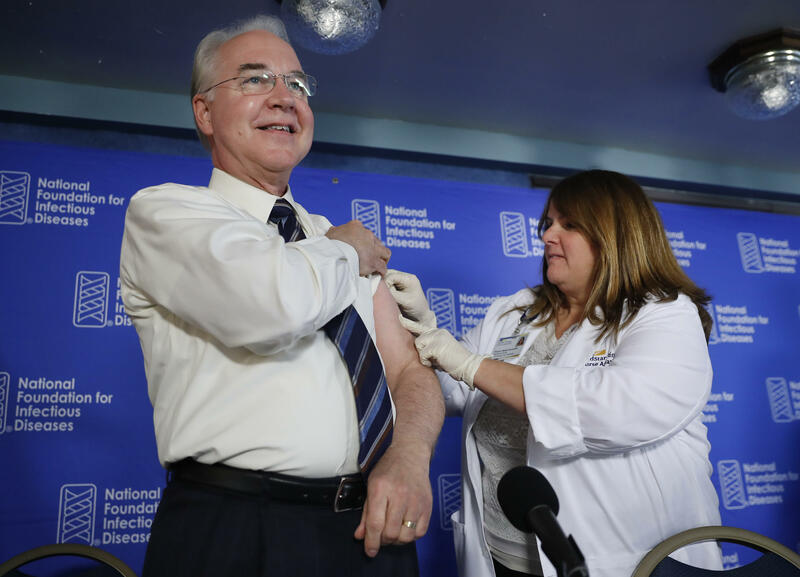 Health and Human Services Secretary Tom Price got his own jab to publicize the importance, saying, "There's no reason not to get protected." CDC's Jernigan cautions there's no good way to predict how bad the upcoming flu season will be. That H3N2 strain caused infections here last year, too. And although strains that circulate in the Southern Hemisphere often spread to North America and Europe, there's no guarantee it will make a repeat performance. Still, H3N2 is "the bad actor," said Dr. William Schaffner of Vanderbilt University and the National Foundation for Infectious Diseases. "If you needed another reason to get vaccinated, there it is. Best get that protection." Flu does constantly evolve, forcing new vaccine to be brewed each year to match the strains specialists expect to cause most illness. In the U.S., CDC's Jernigan said this year's shots aren't perfect — but that the H3N2 strain traveling around the globe hasn't significantly changed, so the vaccine remains a pretty good match. "It's the best tool we have right now for preventing disease," he said in an interview. The CDC says people who get flu shots have a 40 percent to 60 percent lower chance of getting seriously ill than the unvaccinated. If someone is infected despite vaccination, generally they have a milder illness than if they'd skipped the shot, Schaffner said. "I like to tell my patients, 'You're here complaining, that's wonderful — you didn't die,'" he said. It takes about two weeks for good protection to kick in. Flu season tends to peak around January, but there's no way to know when it will start spreading widely. Manufacturers say between 151 million and 166 million doses will be available this year. It's already widely available in doctors' offices and drugstores. You can't get influenza from flu shots, specialists stress. But flu vaccine doesn't protect against colds or other respiratory viruses that people can confuse with influenza. For needle-phobes, there's a skin-deep vaccine that uses tiny needles, and a needle-free jet injector that shoots another vaccine through the skin. Two vaccine brands target the 65-and-older crowd. They're especially vulnerable to flu's dangerous complications because they tend to have more underlying health problems than younger people — and because standard flu shots don't work as well with age-weakened immune systems. One high-dose version contains four times the usual anti-flu ingredient, while a competitor contains an extra immune-boosting compound. FluMist, a less ouchy nasal spray vaccine, once was popular with children. But last year, a baffled CDC said it was no longer protecting against certain influenza strains as well as regular flu shots — and told doctors not to use it. That's the same advice this year: Youngsters will need a shot, just like their parents.